We currently have 17 kennels. Each kennel far exceeds the size required by legislation. 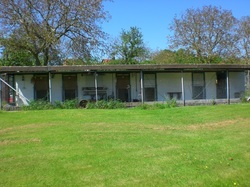 The kennels are laid out into 4 separate blocks. Kennels have wire fronted doors and a shutter, so they can be closed up at night. We have heating for when its cold. For dogs who are from the same household, but are unable to be left together we can open up 2 kennels and provide a divider so they are together but apart. Alternatively if you have several large dogs from the same household they can make use of two kennels to allow more space. Please be aware these arrangements should be made at time of booking and will occur the charges associated with booking both kennels. We provide dog bowls and plastic beds. We recommend you bring your own soft bedding's as they provide comforting scents for your dogs whilst they are enjoying their stay. You may also wish to bring a favorite toy, but please let us know if you would prefer for it not to be left in the kennel with your dog. 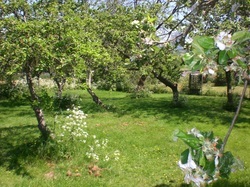 Each kennel block has access to its own exercise paddock area with trees and hedges to explore. Dogs are taken into the paddock areas several times per day to allow them to exercise. Whilst in the paddock they will receive some individual attention, whether their preference is a fuss or playing with a favourite toy. For those not used to running or those likely to make a run for freedom, we have extendable leads to take them for a walk in the fields. We are able to provide either dried or tinned food, however if your dog is particularly sensitive or on a special diet we recommend you bring their normal food with them and we shall feed them as per their usual routine. Plenty of fresh water is provided in the kennels at all times.